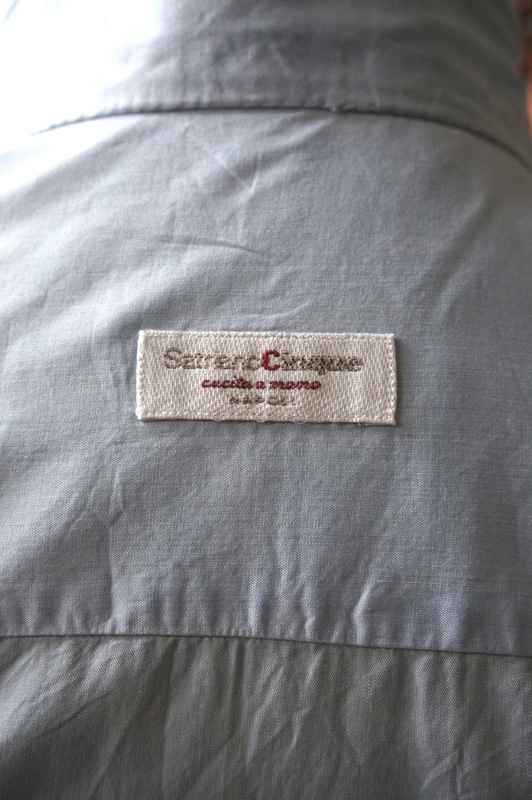 The second post in this series on bespoke shirts looks at Satriano Cinque, the Neapolitan maker that was set up by Gabriella de l’Ero a few years ago. Luca is the men’s cutter, and it is he who cut this shirt. You can see detailed pictures of his work here and shots of the two fittings we did on the shirt here. 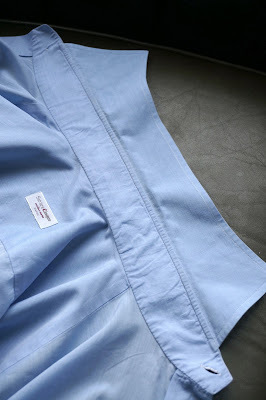 The first thing you notice about the shirt, in common with all those I have had made in Naples, is its weight. 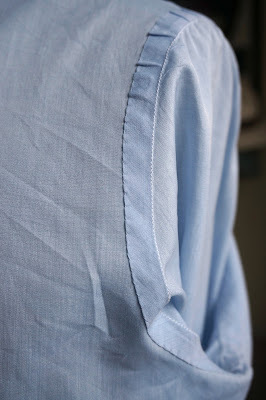 It is incredibly light, which is partly due to the cloth but also the extremely thin fusing in the collar and cuffs. The seams, at the sleevehead for example, are also that much wider, which makes it less rigid. The whole thing bundles up into a mere handful of cotton. The hand work sits half way between English shirts, which typically have no hand stitching at all, and makers like Burgos of Madrid or other Neapolitan makers like Kiton. The functional things are done by hand – attaching collar band and sleeve – as well as aesthetic details like buttonholes and attaching buttons. But the bottom edge and the cuff are done by machine. This is reflected in the price, with shirts starting at €180. The only problem is you have to go to Naples, at least twice. We are trying to arrange a series of visits to London, however, to tie in with tailor Solito (for whom Satriano makes the shirts). The fit of the Satriano shirt was good. Not perfect, and not that much better than Burgos despite two fittings. (Though Burgos effectively had one fitting, given I sent it back to be changed once.) For the next order I will have the waist taken in by around an inch. Interestingly, Satriano uses darts in the back where none of the other makers reviewed this week do. One of the most notable differences with Satriano was the shape of the collar band. It noticeably widens around the side of the neck, before narrowing again at the front. The effect of this is to make the collar stand up much more when not fastened. It sits happily under a jacket or crewneck sweater – indeed, it’s the only (non-buttondown) shirt that sits happily under my Anderson & Sheppard jackets, which have a larger and tighter collar than those of any other tailor. Other differences: the third button sits a little low, exposing more of the chest when worn without a tie (I may have this raised a touch); there is a bigger tie gap than Burgos, but less than Segun Adelaja (review tomorrow); the initials were straighter than Burgos, but not on the bottom edge as I requested (again, this will be changed next time). Overall, my favourite shirt so far, with exactly the right balance of hand stitching and machine for my money. Presuming the tweaks work out with the next order, this is likely to be my shirt of choice from now on. 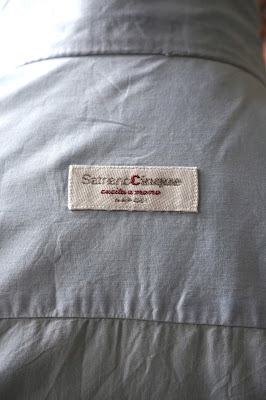 You can follow the discussion on Satriano Cinque: Bespoke shirt review by entering your email address in the box below. You will then receive an email every time a new comment is added. These will also contain a link to a page where you can stop the alerts, and remove all of your related data from the site. These shirt reviews are absolutely fascinating, thank you so much. In my experience finding a good bespoke shirt maker is near impossible. I too have been disappointed by the English makers but also by a couple of the Italians. It seems very much easier to find good tailors and boot makers than it is shirt makers, why do you think this might be? I think people’s expectations of a shirt are very different. Most expect it to fit very neatly, as well, which often it can’t do and be comfortable. Plus many cutters, particularly English ones, are not used to doing a fitted shirt at all. Then, it’s not as big business as tailoring so there are fewer of them. Far more high-end RTW and MTM. Simon firstly thanks for all that you do – I find your website a goldmine of information. All that is missing now is a forum where, all like minds, can discuss our obsession with elegantly fit clothing. With regard to cut, Shirtmakers should deliver what the customer wants not what they are comfortable or experienced in making. If a Shirtmaker is worth his salt, he should meet the same requirement of the bespoke tailor – i.e a neatly, elegant and exceptionally tailored garment whose comfort belies its close fitting form. All clothes are restrictive to some degree and body type is a huge variable when it comes to fit and function. I am 50 years old and I have a flat stomach and an athletic physique -I have close fitted clothes that deliver all the comfort I want – granted I will not be performing gymnastic moves while wearing them. 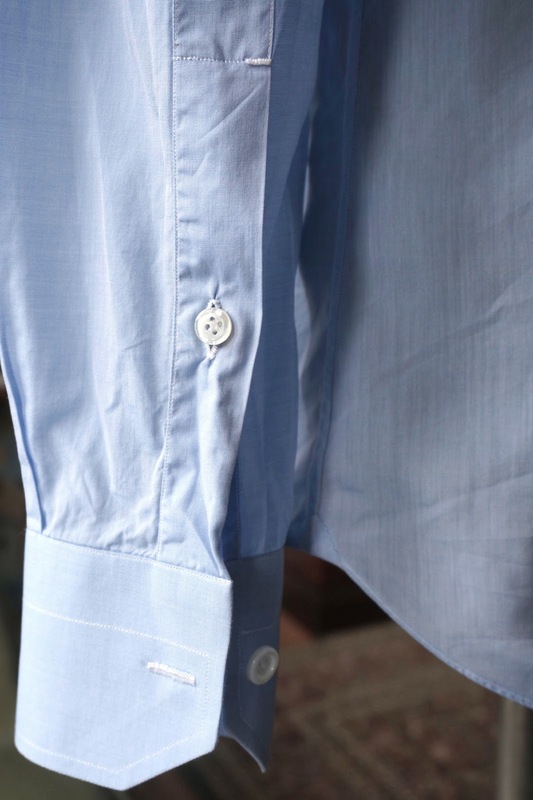 What I suspect is that many Shirtmakers are rooted in old traditions and have not adopted a more efficient, empirical and cost effective approach embracing new technologies to deliver the perfect fit for each customer – comfort notwithstanding. What do I care if a machine can cut and deliver a better fitting garment? There are certainly enough fora out there! Fabulous post as always Simon, how would one go about arranging a date/time with Satriano (in Naples) to make an order? Do you believe you could get away with one trip out there i.e. a week stay one day for initial measurements and, later in the week a fitting? Yes that might be possible, though I know he’d prefer longer or another fitting. This shirt looks fantastic. Do you know when Luca might be coming to London? Unfortunately I do not think I will be able to make two trips to Naples. I would definitely be up for few shirts if Luca comes to London, if it helps numbers wise for your talk tomorrow. Looks like anything you might get off the peg or “4 ofr £100” … nice to know it’s got hand made buttons holes or real pearl buttons, etc.., but really — is the fit any better than off the rack ? Did you notice all the puckering under your right arm and how the sleeves seem to be too long, etc ? I would be happy to meet you in on of the 4/£100 joints and prove to you that the fit you have in this shirt will be largely indistingishable from M&S, Charles Thywhitt, etc. The photo, as I warned, is always a bad reflection of the fit. To conclude what you do, having not seen me or the shirt is absurd. I’ve tried both, you haven’t. Why on earth would you be able to reach that conclusion? Very interesting as usual ! What fabric did you choose? Did you have any success in convincing Sartriano to come to London? We don’t do any fitting but we will make the necessary changes in order to get the customer satisfaction, usually we see the customer with the shirt once, when we deliver it, some others prefer to use it and wash it at least 3 times in order to request any alterations. The fabrics weight of your shirt was Spanish cotton, but we have a good selection of lighter cottons , the type of interlining and other details such as pleats on the back or darts we do them, if the customer wants it, this way. The tie gap is also a customer decision, of course we also give our recommendations. Are the collars on the Satriano shirts fused? Just received my first shirt from Luca, and got that impression. Thanks, but does not that reduce their longevity? Ie bubbling will eventually occur? Hello Simon have you come across any shirtmakers with the design flair of Ted Baker. My Ted Baker shirts which I have fitted need longer arms – So bespoke is the way to go. Problem is that most of shirtmakers focus on formal work shirts. Are there creative beskpoke shirtmakers out there? I read the article about Satriano Cinque on your blog and became interested. If I would like to purchase a shirt from them how do I do? I guess I should visit their shop in Naples, but is there I demand in how many I have to buy as a “start-up”? I also wondering about the price for the service, I understand it depends on choices of fabrics and so on. 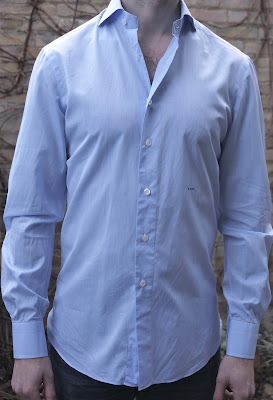 First off, Satriano is now operating under the name Luca Avitabile for men’s shirts. Second, Luca is a bespoke maker so the best thing to do is call or email him to arrange an appointment. Hi Simon, I was wondering whether the extra handwork of a Neapolitan shirt, would make it less durable than, for example, a British shirt? Would extra care be required for laundry? Thanks.